When the Financial Times published its first MBA ranking in 1999, the Harvard Business School claimed the #1 spot ahead of a familiar list of top US business schools, including Columbia Business School, Stanford GSB, The Wharton School and MIT Sloan. Fifteen years later, and Harvard is again #1, with only the London Business School representing European business schools among the top 5, with MIT Sloan now further down the list. 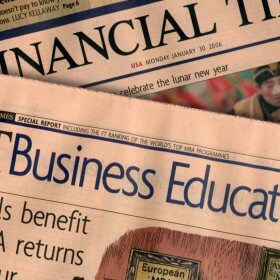 Arguably the most influential business school ranking along with that of BusinessWeek, which launched the media circus of MBA league tables back in1988, the Financial Times was the first to combine the results from schools in the US and the rest of the world – a point of apples and oranges contention ever since. With 40% of the FT’s methodology based on the weighted salary and salary increase 3 years after graduation, MBA programs with strong placement in financial services and consulting have typically outperformed others. So business schools whose graduates pursue a career in industry, non-profits or entrepreneurial start-ups are unlikely to compete with the high salaries on Wall Street or at McKinsey, Bain and other strategy consultants. - The overall growth in the MBA market. The 1999 FT MBA ranking included 50 business schools, compared to the 100 schools in 2013. Many other schools now complete the FT survey every year, eager to break into the lower reaches of the table, and reassure potential applicants that they are among the best business schools in the world. - The rise of Asia Pacific and Canada. The results in 1999 did not include a single business school from Asia or Australia, and only three from Canada. Today, two Chinese schools feature in the top 20, with a total of 22 schools from Australia, Canada, China, India, Singapore and South Korea in the top 100. - The consistent performance of the top 10. With Harvard Business School again at #1, they feature alongside Stanford GSB, Wharton and the London Business Schools as the only four business schools to hold the top position. But as the table below explains, the number of business schools who have made the top 10 in the past fifteen years remains a very select group. - The emergence of world class business schools. Since 1999, a handful of business schools have emerged from seemingly nowhere to stake their claim at the top table. Notable examples are China’s HKUST and CEIBS, Spain’s IE Business School and Esade, France’s HEC Paris, and the UK’s Cambridge Judge and Oxford Saïd. - The battle to stay at the top. The downside of ranking #1 is that there is only one direction you can take from there. But the FT MBA rankings of the last fifteen years also shows how difficult it can be to keep your top 10 position when faced with fierce global competition. Cornell Johnson, Northwestern Kellogg, NYU Stern, Tuck, UCLA Anderson and Yale SOM have all featured at some stage in the top 10, and though the margins that separate the #10 from the places further down can be narrow, business schools face a battle to maintain or improve their position each year. So what will the FT MBA Ranking of 2028 look like? The dominance of a small handful of schools suggests that we will still see the usual suspects at the top of the rankings, but with the growing attraction of the one-year MBA program, and continued economic growth and opportunity in Asia and other emerging regions, expect to see more business schools from BRICS countries and beyond.